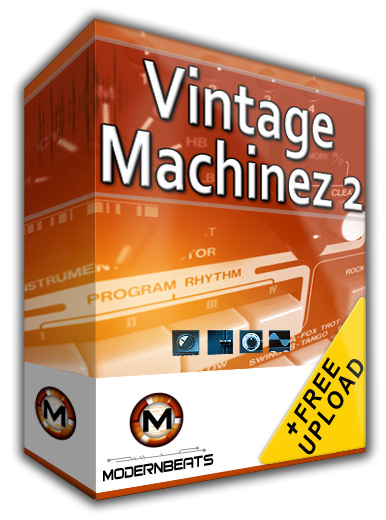 Download Vintage Machinez 2 - Specifically geared for today's Dirty South, Crunk, & Trap music producers, ModernBeats presents the sequel drum library "Vintage Machinez 2"! Featuring 1,056 samples across 39 different kits, Vintage Machinez 2 provides a phlethora of high-quality classic analog drum sounds. Each kit is separately arranged into presets for easy loading into all major software samplers. Native formats include HALion, EXS24, Kontakt, Battery, Reason's NN-XT, SF2, and Wav. Drum machines in Vintage Machinez 2 include Boss Dr. Rhythm 55, Boss Dr. Rhythm 110, Casio PT-30, Casio PT-68, EMU SP-12, Fairlight II, Hammond Auto-Vari 64, Hammond Drumbox, Korg KPR-77, Korg Rhythm-55, Pearl SC-40, Univox Micro-Rhythmer 12, and Visco Space Drums. A list of all samples include kicks, subbass kicks, snares, claps, rims, closed hats, open hats, ride cymbals, crash cymbals, wide variety of toms, congos, bongos, guidos, shakers, cabasa, tambourines, bells, timbales, tablas, cowbells, claves, woodblocks, wood sticks, tympani, digital blips, laser zaps, explosion, and many other exotic sounding percussion. Vintage Machinez Collection - Remastered Drum Classics & More: The Vintage Machinez Collection (Volumes 1 & 2) offers users a a huge collection of remastered classic drum samples for all major software samplers! Each soundset is divided into 3 major categories for quick and convenient use. Categories include newly remastered Mono versions, plus unique Stereo and "Xtreme" versions specifically geared for Bounce, Dirty South, and Crunk styles. All ModernBeats' Vintage Machinez presets give users a new level of power over each classic machine where users gain control over velocity, duration, pitch, and all other user-defined parameters. Such programmed features go far beyond the capabilities of the original machines. In addition to these added features, each kit contains identical layouts for all Mono, Stereo, and Xtreme versions! Such layouts give users the ability to swap any sample version for another within a sequence, bringing a new level of ease and creativity to producing beats!